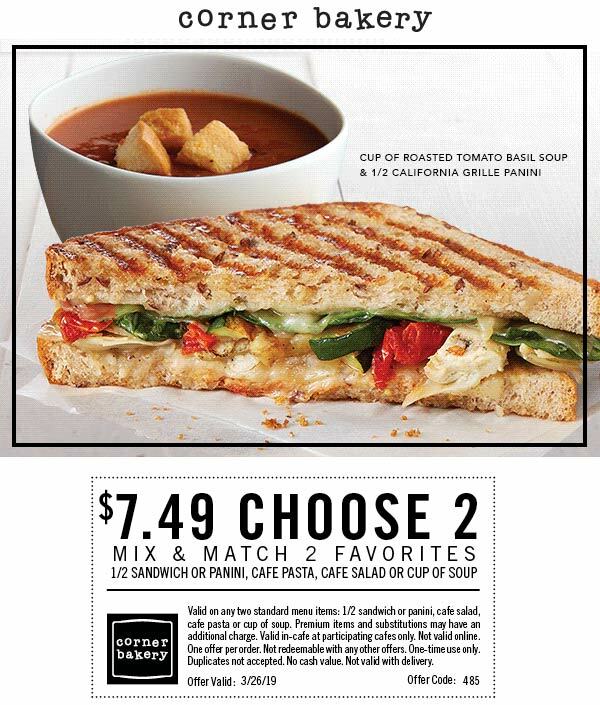 Another Corner Bakery Cafe coupon is now available! Corner Bakery Cafe is a casual, counter-serve cafe chain offering a standard menu of sandwiches, pasta & pastries. Come to Corner Bakery Cafe, your neighborhood restaurant offering healthy, fresh and delicious food choices, free WiFi and catering available for any occasion. On a Corner. That’s Where it Started. Inspired by great fresh ingredients, our small neighborhood bakery on a corner in downtown Chicago began creating artisan breads and freshly baked sweets. And upon a little success, neighbors began to ask us for sandwiches made with that fabulous bread, followed by homemade soups and salads, and even made-to-order scramblers. Our guests’ requests continued to inspire us as our bakery’s menu and business grew. Today, we continue to fulfill the needs and desires of our neighbors with a menu of ingredient-inspired, prepared-to-order food. When you visit our cafe, you’ll see real kitchens in place of assembly lines. You’ll hear the chopping of over 40 types of fresh herbs, fruits and vegetables, and the sizzle of our real panini grill. You’ll see the stove’s open flame and feel the warmth from our ovens working all day long. They’re the traditions we established years ago that we still passionately follow today. Search for deals and coupons from Corner Bakery Cafe and over 100,000 other retail stores, gas stations & restaurants inside The Coupons App. Explore exclusive shopping and restaurant offers at thousands of nationwide and local chains. Browse our best coupons, free samples, view local deals or see popular retail stores. Get alerts when we offer hot new savings at Corner Bakery Cafe and all your favorite restaurants & stores. Get automatic notifications when Corner Bakery Cafe deals are nearby. Save coupons for viewing anytime, anywhere. 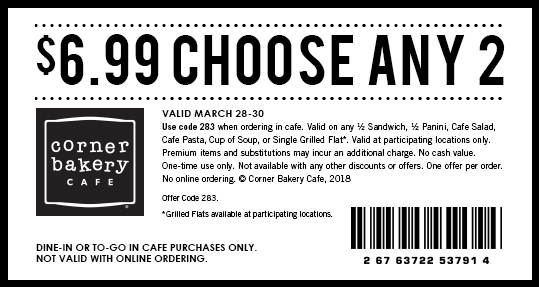 Get calendar reminders when your saved Corner Bakery Cafe coupons are about to expire. Win fantastic giveaways from our weekly contests!